We're so excited to announce that our newest issue is now available in our shop. Featuring the theme, The Body, this new issue features stories of body image, documented through photo diaries, first person essays, interviews, and more. Body image is such an important topic for women as we've been made to believe that we must look a certain way. In this issue, we're removing that idea and celebrating ALL types of bodies and what they're capable of. 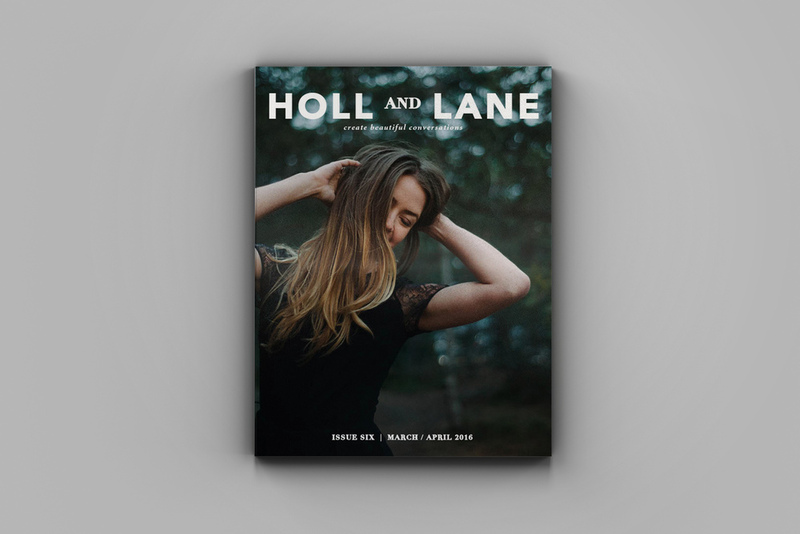 We are so excited to present to you Holl & Lane, Issue 6! Every single issue that we produce is a labor of love and this one is no different. The stories shared are both heartbreaking and inspiring, tragic and triumphant. And we know that you're going to love them. In this issue, find stories on spring trends, yoga moves for beginners, beautiful recipes that you'll want to make TONIGHT, a woman who quit her job to follow her passion (spoiler alert: it's working out REALLY well), divorce at the age of 30, domestic violence, miscarriage, great U.S. travel sites and SO much more. Passion is at the very heart of what we try to accomplish at Holl & Lane. Passion in telling your stories, passion in trying to change the conversation, passion to inspire you. And it is with passion that we began this journey that has been wrought with tears, frustrations and heartache. It’s with passion that we celebrate each issue and the excitement that comes from a reader telling us how much a story meant to her. Each moment spent working on H&L is filled with passion. We all work tirelessly on this project as volunteers, with no compensation for the hours upon hours that go into this brand and that is because of our passion for this project. We know we’re making a difference, we know we’re starting a conversation, and we know that you need this as much as we do. So please celebrate with us our newest passion- Issue 6, available in our shop. We hope you love it like we do. We are overjoyed to start the New Year with a bang and introduce you to the 5th issue of Holl & Lane. This one is 116 pages full of stories that will have you smiling, crying and cheering. We gave you a peek into 4 feature stories this week and now we're ready to share it all with you. In this issue we're also introducing a couple of new series to you, the first being the H&L Girl that you'll find at the beginning of each issue. We're so inspired by all women from all walks of life and we wanted to recognize just one with each issue. The H&L girl is creative, smart, capable and strong. She is honest and humble and appreciative. She is kind and powerful and wants to help others see the beauty in their lives. The second new series is a student spotlight in which we feature stories from students around the world. Their willingness to share and open their hearts to let us all in is humbling and beautiful and we're so excited to spotlight these talented writers. So now it's your turn to dive in. 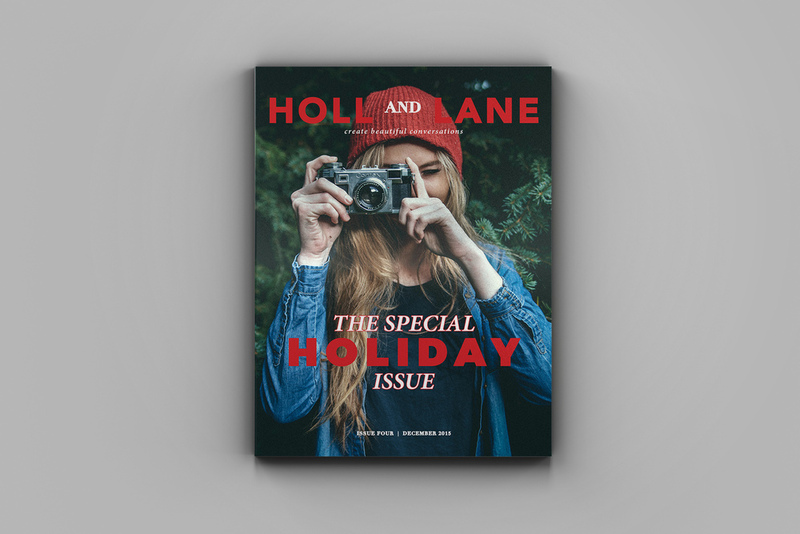 Start your New Year off with something inspiring and powerful and pick up Holl & Lane, Issue 5. Happy Tuesday everyone! And this happens to be an extra special Tuesday because today is the launch of Issue 4 of the magazine- our holiday special. In this issue you'll find holiday party style ideas, drool-worthy recipes, and you'll get to learn about holiday traditions around the world. With social media connecting people from around the globe, I was so excited to talk with women from all over who were willing to share a bit about their traditions to see how they may differ from my own, and traditional American holidays. This special edition of the magazine will also give you inspiration for decorating your home for the holidays (with much less stress! ), inexpensive gift ideas to put under the tree, and DIY's for getting your home ready for parties! I hope that you love it as much as I loved putting it together and I hope it makes your holidays a little bit merrier. CLICK HERE TO READ ISSUE 4 OF HOLL & LANE MAGAZINE.